GreenTech Media has an article on California's efforts to encourage the development of 1.3 GW of energy storage - California Sets Terms of Massive Energy Storage Mandate. On Tuesday, the California Public Utilities Commission released a long-awaited proposal for mandating an unprecedented 1.3 gigawatts of energy storage to support the state’s power grid by decade’s end. Consider it a bold first step into the untested waters of combining new energy storage technologies, regulatory structures and economic models into a working whole. 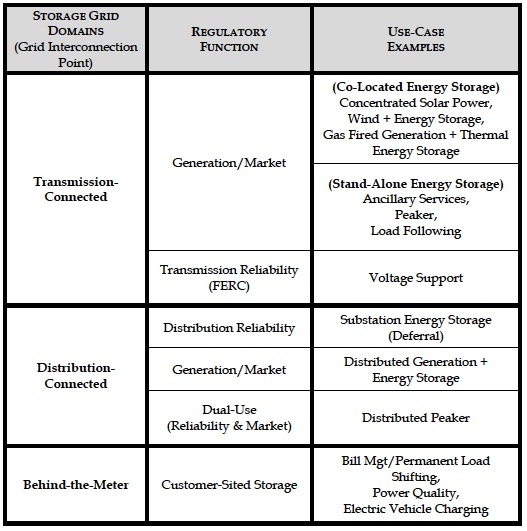 The 81-page proposed decision [PDF] from CPUC Commissioner Carla J. Peterman breaks new ground in seeking to establish a regulatory regime in which utilities, third-party storage providers, and even customer-owned storage assets can play an integrated role. Those include rules that would limit utilities from owning more than 50 percent of the total amount of energy storage to be procured across the three “grid domains” of transmission, distribution, and customer-located storage. New research has predicted that the German government’s measures to support energy storage uptake – namely its relatively new solar storage subsidy program – could trigger a boom in the market similar to that once witnessed in the solar PV industry. The €25 million scheme, established in May this year, covers up to 30 per cent of the cost for residential storage equipment when added as apart of a new residential PV system. Research analysts IHS say the subsidy could trigger the sort of rapid uptake of solar PV energy storage systems that the government’s feed-in tariff (FiT) system ignited in the PV industry eight years ago. “The adoption of residential PV energy storage in Germany will accelerate in 2014 as a result of this subsidy and falling prices of the storage system,” said IHS research manager, Sam Wilkinson – adding that energy storage systems allow households to increase their level of self-consumption from around 30 per cent to around 60 per cent. Already, 1,100 applications for the subsidy have been approved, according to the German solar association, with 4,800 more working their way through the system. Wilkinson says IHS expects Germany’s energy storage market to be dominated by the residential sector, with 30MW of installations already supported by the subsidy in 2013. “Periodic decreases in FiT and continually increasing electricity prices, coupled with decreasing PV system prices, have now made it financially favourable for a home-owner to self-consume PV energy on-site rather than export it to the electricity grid and receive the FiT,” he added. Meanwhile, to further capitalise on the solar storage market, the German government is co-funding the local development of a 5 megawatt-hour battery designed to store surplus renewable energy.